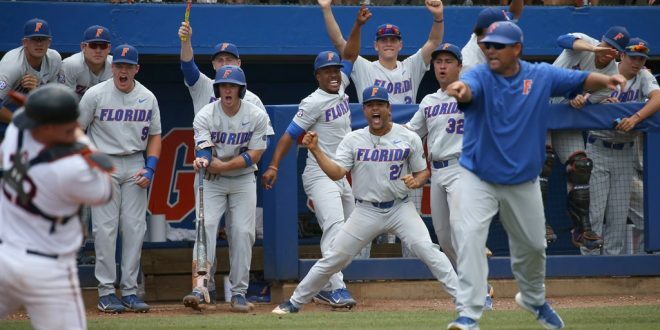 After a disappointing Game 2 loss against the South Carolina Gamecocks, the Florida Gators shook off Friday’s to earn a much-needed Game 3 victory. In a ninth inning two out rally, Florida’s Jordan Butler hit a three-run homer to right field to give the Gators a 6-4 victory. The win for Florida (24-14, 6-9 SEC) clinched the series over the Gamecocks (21-15, 4-11 SEC). Florida started Tyler Dyson on the mound Saturday and he gave up four earned runs on five hits in 4.2 innings. He talked about the importance of the victory over South Carolina. Relief pitcher David Luethje proved to be the Gators’ best pitcher of the weekend. Luethje pitched four strong innings in relief to get the win, allowing two hits and zero runs to improve his record to 1-1. South Carolina’s starting pitcher TJ Shook pitched five innings, allowing four hits for two runs, including one home run. After a scoreless first inning, South Carolina quickly got things going at the top of the second inning. Brady Allen hit a homer to left field to give the Gamecocks a 1-0 lead. Florida responded with a home run of their own to even the score. Jordan Butler hit his first career home run to tie it up, 1-1. Jordan's first career homer is an opposite field shot to tie the game 1-1. Florida and South Carolina exchanged another set of runs in the third inning to keep the game even at 2-2. In the top of the third, TJ Hopkins doubled to center field followed by an RBI double from Luke Berryhill to advance Hopkins home. Florida’s Austin Langworthy singled to left right center to advance Jacob Young in for the run. However, South Carolina carried their offensive momentum into the fifth inning. After back-to-back hits, Hopkins recorded an RBI to give the Gamecocks a 3-2 lead. Jacob Olson furthered South Carolina’s lead, 4-2, with an RBI single that plated Hopkins. In the bottom of the seventh, the Gators were on the verge of a two-out rally. Brady McConnell hit an RBI single to cut the Gators deficit to 4-3. But with the bases loaded, Kendrick Calilao lined out to shortstop to end the inning. Luethje kept the Gamecock bats silent and it set up a dramatic ninth inning for Florida. The Gators had two outs and no one on in the bottom of the ninth when Austin Langworthy and Kendrick Calilao drew walks. That sent Butler to the plate, and he smashed a home run to right field to give Florida the win. Butler had a dominant performance at the plate going four for five, including two home runs and four RBI. The Gators will face Jacksonville University in a midweek match-up before traveling to LSU to take on the Tigers in an SEC series. You can catch live coverage of the Gators midweek game on SECNetwork+ or listen live to 98.1 FM/850 AM WRUF.